AGL team successfully completed a drainage system project in Didachara village, Khulo. The purpose of the project was to channel the ground waters in controlled manner and this way minimize the impact of flooding by safely carrying the water. 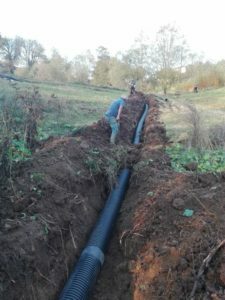 The design of the project was developed by AGL engineers, local mayor’s office of Khulo municipality was also involved in terms of providing heavy machinery to local workers. – arrangement of open channel. 25m footpath was also constructed connecting the village to the central road. 4 villagers were employed during construction activities, AGL engineers were supervising the works. 40 households will benefit from the new system.